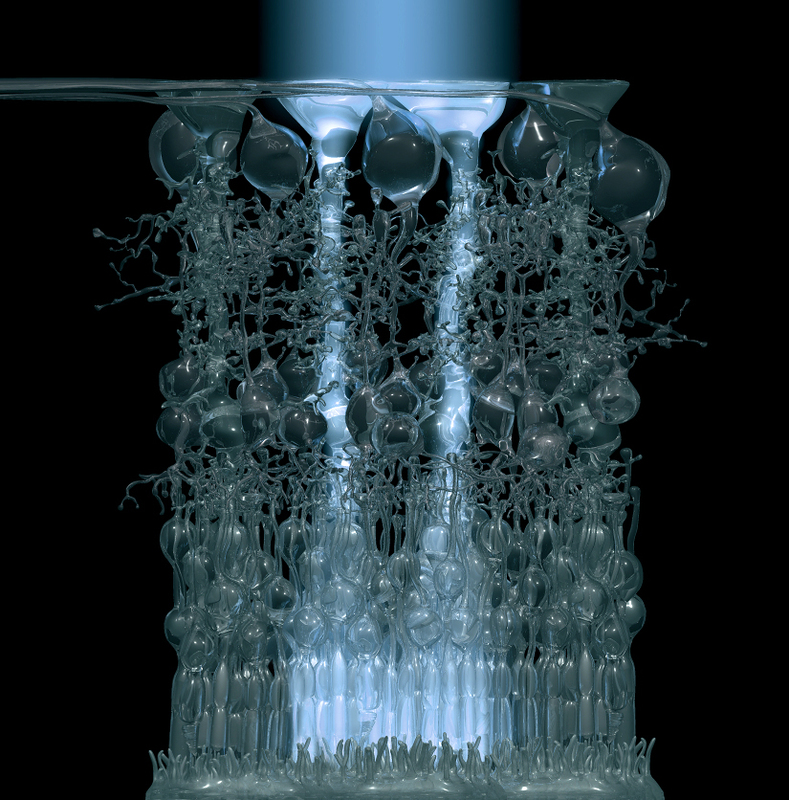 Bob Enyart and Fred Williams have a ball listing six of the insurmountable problems for the evolution of vision. The guys start with the data stream that flows from an eye to the brain explaining the absurdity of the blind claim that a non-directed material system could arise to decipher such an encoded data stream. (See this on page 181 of Bob's debate with Zakath, Does God Exist?) The guys then point out that after 150 years of effort, the world's leading eye evolution experts know nothing about eye evolution. Then they mention the Opsin protein in the photoreceptor cell and point out that the leading eye evolution text offers nothing in the way of an explanation for how that approximately 350-acids long chain originated. The guys then point out the inability of leading evolutions to answer RSR's Trochlea Challenge, which asks merely for a rudimentary evolutionary description of how one of the simplest aspects of the human vision system could have originated. And finally, just before airing a brief eye evolution comedy routine from Richard Dawkins, Bob and Fred discuss the inability of Darwinism,, which operates via small incremental steps, to move from monochromatic (black and white) to di- or trichromatic (color) vision, since even theoretically there ARE NO small steps between black and white and a vastly more complex color vision system. Please see all this at rsr.org/eye. * RSR Interviews a UC San Francisco Professor of Ophthalmology: Real Science Radio hosts Bob Enyart and Fred Williams analyze Bob's informal debate from two years ago with clinical professor of ophthalmology Dr. Gary Aguilar on the evolution of the eye. In 2012, Gary recommended that Bob read a new book by Dr. Schwab, a colleague of Aguilar's at UC Irvine, about which Russell Fernald says that Evolution's Witness is "likely to be consulted by everyone interested in evolution and eyes." If you enjoy today's program, you may also enjoy Part 2 and Part 3. * Missing Opsin Chapter: Opsin is the protein in photoreceptor cells that can detect a single photon and then signal that a photon has struck it. One might expect from a book on eye evolution that after the introduction, the author might include a chapter on an explanation, conceptually, of how opsin might evolve. Evolution's Witness is missing such a chapter. In vertebrates and invertebrates, opsin requires a chain of 150 to 250 amino acids which then must be folded correctly into a very specialized nano-machine which can pass along an output signal whenever the protein gets hit with a photon. But as creationists expect, no such chapter exists in the book. And actually, all the difficult problems that one would have to address if he were actually writing a book on How Eyes Evolved are missing from Ivan Schwab's book. 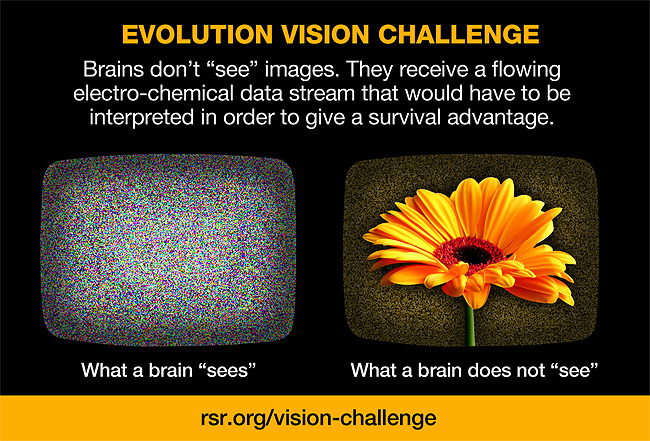 * Missing Vision Challenge Chapter: Bob Enyart brought up this vision challenge to Gary Aguilar, but, like most atheists and evolutionists we've discussed this with, Gary was unresponsive. It appears that atheists and evolutionists do not even know how to think about this problem, let alone can they offer any conceivable notion about how it could even theoretically be solved. See this vision challenge presented in full from our debate with TheologyOnline.com's resident atheist Zakath. 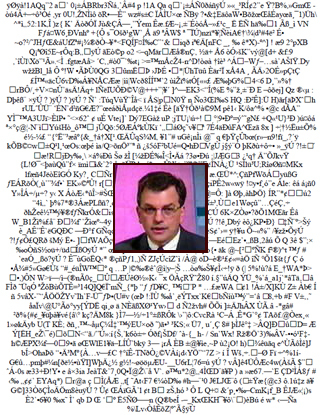 Bob had predicted that even a state-of-the-art "tour de force" textbook by an ophthalmology professor would not even begin to describe how vision might evolve, and also, that this interview with an ophthalmologist professor would demonstrate their basic inability to substantively think through something that they routinely oversell to the public as a done deal. "We know 'how eyes evolved,' only an ignorant person would doubt our claims." At 2:33 into an interview on The Evolution of the Eye, Richard Dawkins illustrates the RSR "APPtitude test," aka, the Atheist Popularity Postulate, that the evolutionists who become the most popular are the ones who say the most absurd things with the straightest face. Imagine his evolving, curling, sheet of light-sensitive paper sending a static-like data stream to an unwitting brain that must then interpret the predator's shadow or direction of light (from the data represented by the screen above, on the left). 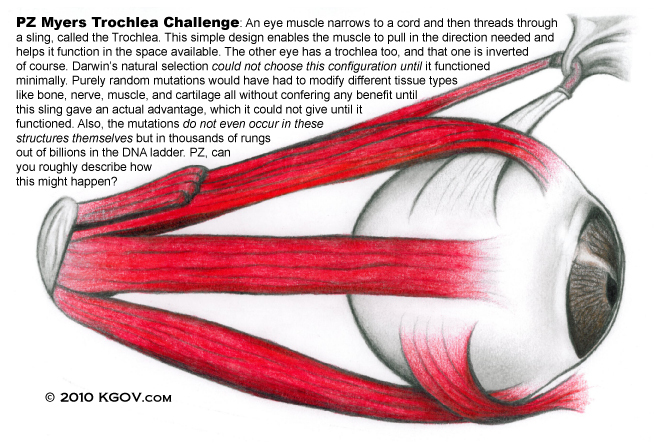 * The Missing Trochlea Challenge Chapter: Ivan Schwab doesn't include a chapter on how simple mechanics of the eye would have evolved, as illustrated in this trochlea challenge which has been circulating on the web in evolution circles from well before Schwab's book was published. 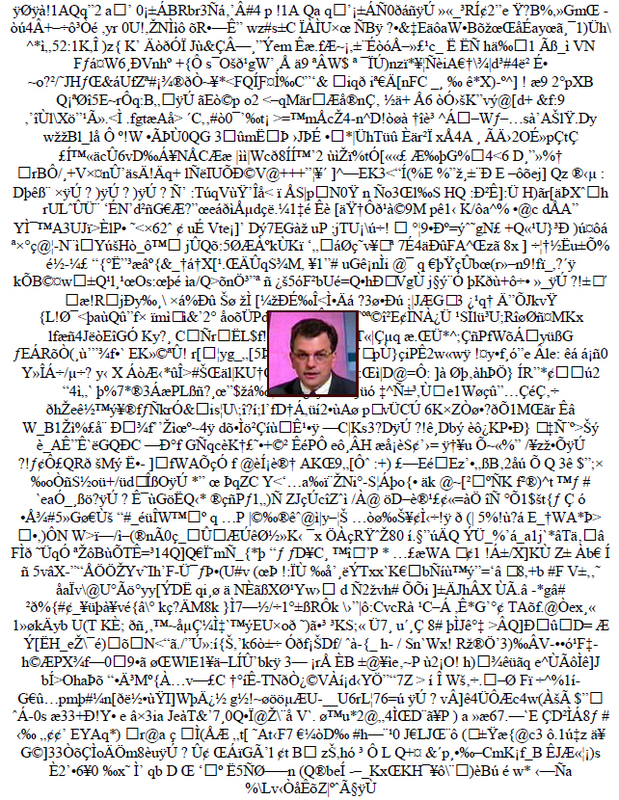 In 2012, we sent to Gary our PZ Myers Trochlea Challenge. It's this simple sketch of the human eye, with a single question in its caption. 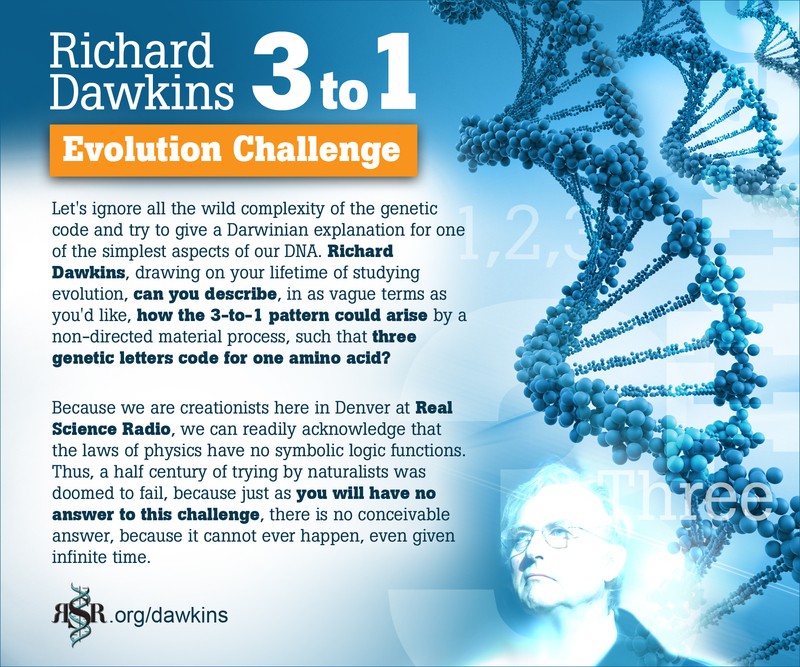 Well-known evolutionist PZ has responded to us admitting that he cannot answer this challenge. We appreciate that truthfulness. For more about PZ and this Trochlea Challenge, see rsr.org/pz for Meyer's response. And for a full presentation of this challenge, please see our debate on Entropy and Evolution that was prompted by an American Journal of Physics paper by Prof. Dan Styer (in which Styer himself joined in). Bob Enyart presented the trochlea challenge in detail explaining why evolution could not bring about something even as conceptually simple as the trochlea. And of course, if evolutionists can't explain how the trochlea would form, they certainly cannot explain, and therefore take by faith, that stationary eyes somehow evolved into eyeballs that could move up and down and from side to side. * The Missing Dichromatic Challenge Chapter: RSR is calling this our Richard Dawkins Dichromatic Challenge. Consider an organism which can see in black and white, and then estimate the necessary steps required to modify it to see color also, sufficiently well to give it a survival advantage. Of course, until the dichromatic vision provides a survival advantage, natural selection cannot guide its development. RSR's atheist interviewee, UCSF professor of ophthalmology Gary Aguilar never got around to acknowledging this problem, let alone answering it, and neither did his colleague Ivan Schwab. 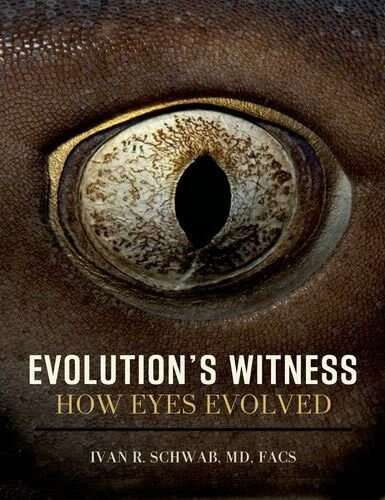 In the forward to Schwab's book, Evolution's Witness: How Eyes Evolved, eye evolution expert Dr. Russell Fernald echoes Dawkins' "Climbing Mount Improbable", writing that a "complex eye could be formed by natural selection," quoting Charles Darwin only by "numerous gradations" in which "the eye does vary ever so slightly..." If however there are no logical or physiological small steps that are even theoretically possible between a black-and-white type monochromatic system as compared to a dichromatic (and then dichromatic (and then trichromatic) color vision system, that would present a hurdle that Darwinism could not cross. For the obvious survival advantage that would come from seeing in both black and white and in dichromatic color requires detection of multiple wavelength input, the transmission to the brain over an optic nerve of an increased data stream, and the integration of the ever-changing monochromatic information with the color information, a non-trivial data processing feat. Of course, and this is virtually a tautology that cannot be rationally rejected, if there is no logical or physiological step in between "black and white" vision and a rudimentary color vision, then this challenge alone refutes Darwinism. RSR asserts that this is the case and that this alone falsifies evolution. 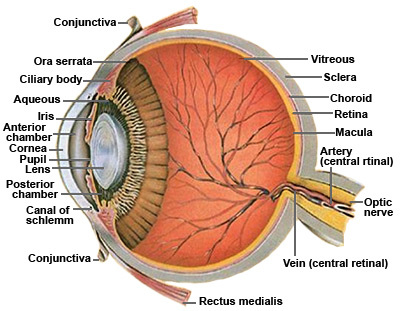 3:15 into our interview, he said, "There are aspects of the human eye, for example, the nictitating membrane [which in some creatures is an additional, transparent eyelid] in lower animals is present in the plica semilunaris which has no function in humans; none whatsoever." Then to Bob's question, "Dr. Aguilar, can you repeat that, what is it that has no function whatsoever?" Gary answered, "The plica p-l-i-c-a semilunaris." However, according to the authoritative Duane's Foundations of Clinical Ophthalmology (Vol. 2, Ch. 2: Plica Semilunaris), the plica functions during movement of the eye, to help maintain tear drainage, and to permit greater rotation of the eyeball, for without the plica, the membrane called the conjunctiva would attach directly to the eyeball, restricting movement. Gary here illustrated something we describe about evolutionists, that rather than being informed with the latest knowledge from his own area of expertise, Aguilar claimed decades out of date "evidence", in his case, on the anatomy of both the wiring of the retina, and on the plica, claiming it is a functionless leftover. Rather than researching his Darwinian claims in the most relevant scientific literature, Aguilar, following Dawkins, ultimately got his outdated claims from a 150-year old book by Charles Darwin. Aguilar also repeats Dawkins' long-refuted claim, based on scientific ignorance and evolutionary bias, that the human eye is wired backward. For an explanation of why our eye is wired the reverse of an octopus, and optimally for human vision, listen to the Enyart-Aguilar-Eye-Excerpts, and see Dr. Carl Wieland's article, and a paper by Peter Gurney, a fellow of the Royal Colleges of Ophthalmologists in a peer-reviewed creation journal, as well as Gurney's popular article that deals with both the plica and the wiring. And read and hear Dr. Jerry Bergman explain that the function of the plica semilunaris has been documented since the 1930s. 2013 UPDATE: Dr. Aguilar wrote to Bob Enyart, "...let me acknowledge that the plica semilunaris is considered to have some function..." though he denied the plica aids in globe movement, thereby apparently disagreeing with the statement in Duane's Ophthalmology that, "if the conjunctiva were to directly join the eyelids to the globe, the globe and eyelids would both be restricted in movement." Perhaps Gary could share his disagreement with DO's Darlene Dartt and help everyone get to the bottom of that one particular detail. * In Contrast to Our Serious Discussion, See Dawkins Describe Eye Evolution: Watch this one minute excerpt of this friendly interview of Richard Dawkins on the evolution of the eye. His encapsulation of wild required complexity into absurd superficiality is common among evolutionists. Consulting Fernald, Aguilar, and Schwab makes it clear that Dawkins is being superficial, not because he's pressed for time in a popular interview, for Schwab takes 300 pages in a college-level "tour de force" textbook allegedly dealing with "how eyes evolved," and never gets beyond Dawkins' sheet-cupping superficiality. * "You need to be set aside" A chilling moment in the debate occured when Dr. Gary Aguilar said to Bob, "You need to be set aside." There is still hope however, for where there is life there is hope. So if Gary asks for forgiveness, Bob and God will forgive him. * Playing the Part : If you enjoyed today's program, you may also enjoy Part 2 and Part 3. and John Woodmorappe's review of Schwab's How Eyes Evolved, titled, Comparative anatomy of the eye in the animal kingdom—with dubbed-in evolution. its prequel Evolution, the Grand Experiment! Today’s Resource: Get the fabulous Carl Werner DVD Living Fossils and his great prequel, Evolution: The Grand Experiment! And have you browsed through our Science Department in the KGOV Store? Check out especially Walt Brown’s In the Beginning and our Global Flood & Hydroplate Theory video! 83-minute Gary Aguilar interview. We assume that Dr. Aguilar is an accomplished surgeon, but with his inability to think clearly, his advocacy of pot, his bad behavior, and his rage against Christians, his patients might want to consider seeing a more professionally behaved surgeon. Last edited by Jefferson; March 13th, 2018 at 07:50 AM.